Vijay Kumar Ojha, Esquire, of Smithfield, NC and Washington D.C. passed away on October 30, 2017 at Georgetown University Hospital. Funeral arrangements are being handled by Brown-Wynne Funeral Home on 300 St. Mary's Street Raleigh NC 919-828-4311. 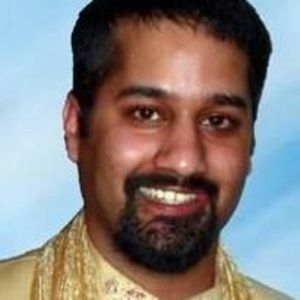 Vijay was born in Smithfield, NC on June 7, 1977. He was a lifelong music enthusiast, not to mention an accomplished singer/songwriter. Vijay was also a noted aficionado of social media, and his medium of choice was Twitter. As such, this greatest hits EP shall only slightly exceed 140 characters. The box set will be much longer. Most recently, Vijay served as Chief Operating Officer for Emotive Corporation of Frederick, Maryland. Additionally, Vijay was an early stage and angel investor of projects he felt benefitted humanity. He graduated with a BA in Business and a MBA in Business Administration, both from his beloved East Carolina University. Go Pirates! Vijay is survived by mother, Mrs. Kanti C. Ojha of Smithfield, a social worker who taught her sons from an early age the importance of seeing the very best in people. In addition to his mother, Vijay is survived by his cats, Penny and Ella, also of the family homeplace. Vijay was the younger of two sons of the late Dr. Brig Ojha MD (Ophthalmologist) who passed when Vijay was only five, instilling the value of caring for others. Vijay was also preceded in death by his beloved cat Tux, and his brother, Dr. Ajay Ojha, PhD. Vijay and Ajay were loving brothers and loyal sons; fierce protectors of each other, and of their dear mother. Two things are a certainty: Ajay loved his brother Vijay with all his heart, always. And, that Ajay loved Vijay's first car, a particularly sweet 1993 BMW 325is, as much his brother did. Visitation will be held at Brown-Wynne Funeral Home in Raleigh on Monday, November 6, from 6-8pm. Funeral services will be held Tuesday, November 7, at 11am. Additionally, a memorial service is being planned in Washington, D.C. by friends, coworkers and loved ones, tentatively set for December 10, 2017. Location and time are being determined. If you would like further information, please email vkojam17@gmail.com .